The name ‘Veda’ is given to the vast body of literature made up of Mantra and Brahmana. 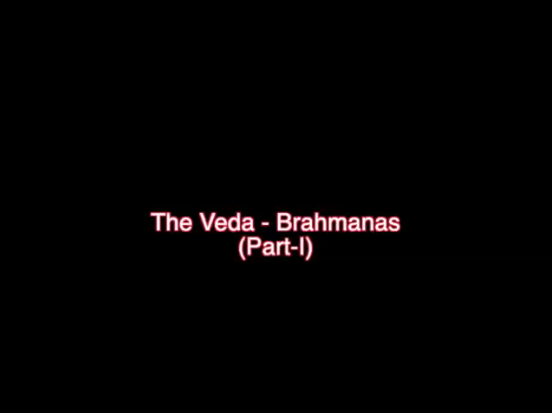 So far we have been referring mostly to Mantras which constitute the Samhita portion of the Veda, now we go to the Brahmanas. Brahmanas are most important among several other texts, which were composed in ancient times to explain the difficult meaning and secret knowledge of the Vedic Samhitas. The word Brahmana in neuter gender means Brahmana texts. Why these literary compositions are given this name? Authors of Brahmanas and their commentators have not offered any definition of this word. Sayana has only said in the introduction of his commentary on the Rigveda: “Which in tradition is not a hymn or a Mantra is a Brahmana and which is not Brahmana is a Mantra”. The term ‘Brahmana’ has been variously interpreted by the scholars. It comes from the word Brahman which means both the Veda and the Mantra – “Brahma Vai Mantrah.” Thus the word Brahmana means ‘that which relates to Brahman or the Veda’. It is derived from the root brih ‘to grow’, ‘to expand’.In other words, the name ‘Brahmana’ means the explanation of a ritual by a learned priest. Later this word came to mean a collection of such explanations by the priest on the science of sacrifice. The Brahmanas are thus the ritual text-books on the details of sacrifice or Yajna. Apastamba defines Brahmanas as ‘Karmacodana Brahmanani’ meaning Brahmanas are injunctions for the performance of sacrificial rites. According to him, these texts deal with the following six topics:Vidhi Arthavada , Ninda, Prashansha , Purakalpa and Parakriti. Vidhi means injunctions for the performance of particular rites. Arthavada comprises the numerous explanatory remarks on the meaning of Mantras and particular rites. Ninda or censure consists in criticism and, refutation of the opponents’ views. Purakalpa refers to the performance of sacrificial rites in former times. Parakriti means the achievements of others. Yajna is not only sacrifice. In Brahmanas we find it as symbolic also. Here it often represents the knowledge of creation and thus describes the secrets of creation.